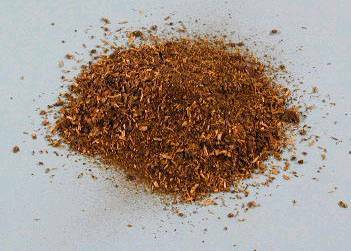 Alfalfa Meal (AM) organic fertilizer is made from the leguminous Alfalfa plant, that also fixes nitrogen in the soil. YES – FREE nitrogen. 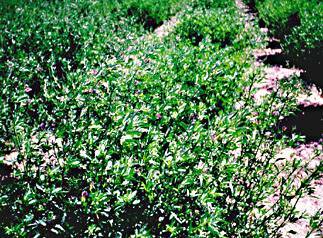 Alfalfa is also an excellent cover crop (see cover crops) or a permanent cover crop for orchards. Alfalfa has the ability to send deep taproots down into the soil for increased soil aeration and conditioning. AM fertilizer is a decent source of nitrogen and a small percentage of phosphorous and potassium. The major benefit of AM is its affect on the soil’s microorganisms. AM contains special microbes that activate the soil’s microorganisms that in turn help convert soil nutrients into soluble forms for the plant… an adrenalin boost for your soil. Another unique feature of AM fertilizer is a naturally occurring compound called Triacontanol. Triacontanol is a growth hormone that boosts plant growth. Its effect is short term and best used as a tea on seedlings. As animal-based fertilizers are coming under more scrutiny, due to certain practices and disease susceptibility, AM will become in important in the future as Nitrogen based fertilizer. Make sure that the AM source is organic. If not, your AM may have pesticide residue.